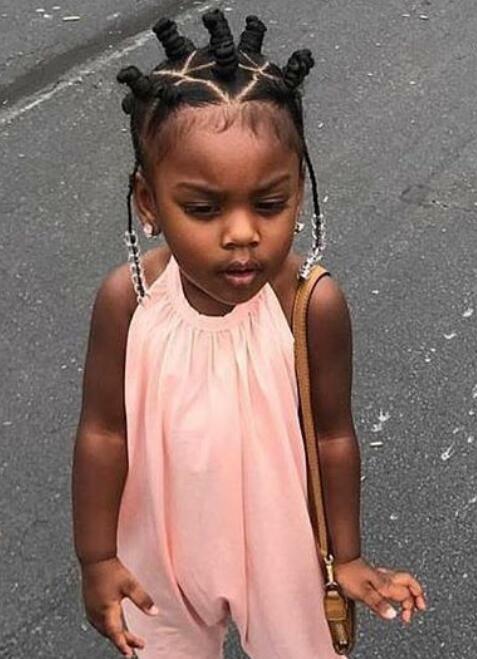 Looking for beautiful hairstyles for little black girl 2019? Optimists like to believe that all things in life are equal. 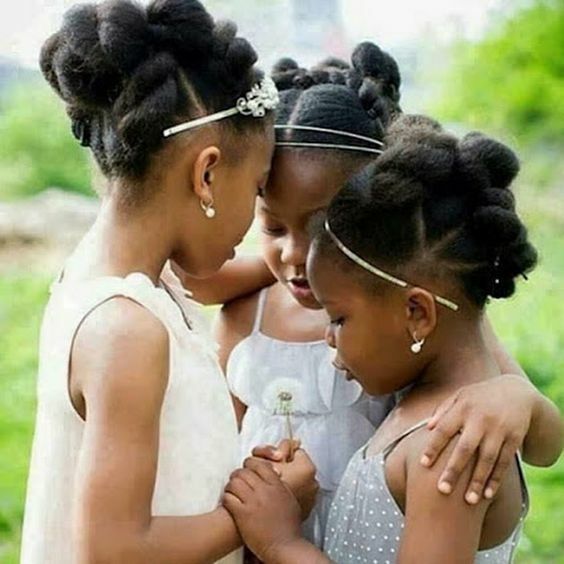 One thing that will never be equal is hair, particularly African-American hair. 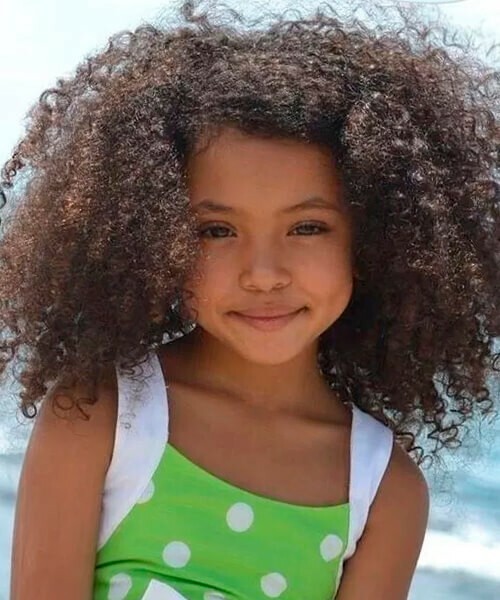 Unlike other races who can have a moderate amount of curls or bone straight, most black people have curled strands of varying tightness. 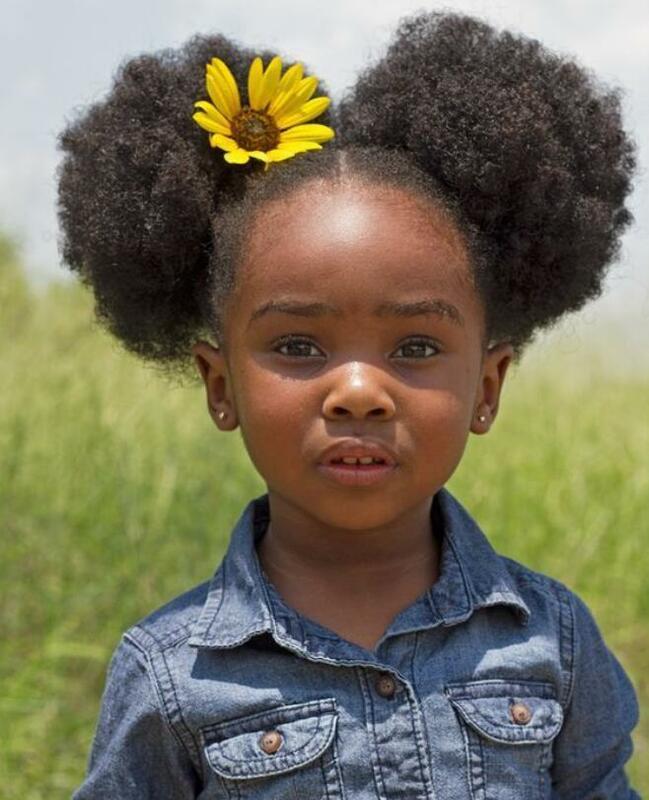 That means it takes extra care in brushing, styling and maintaining the hair of black people, especially little girls, who hate their hair being brushed in general. 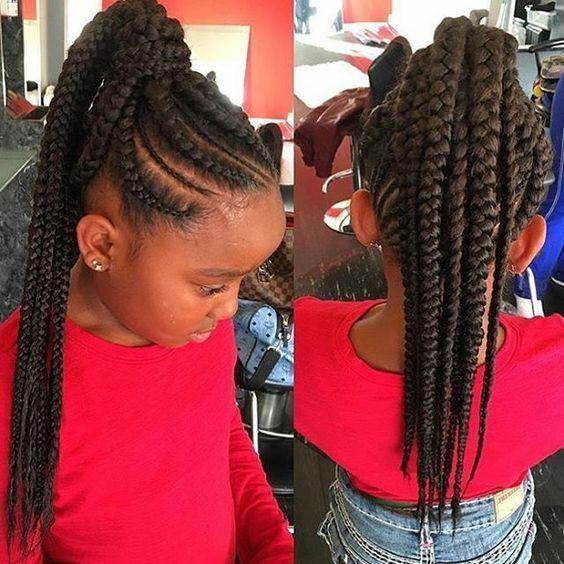 Box braids are an extremely popular and versatile hair style for African-American hair. The hair is first parted into sections (boxes) and each box is individually plaited. 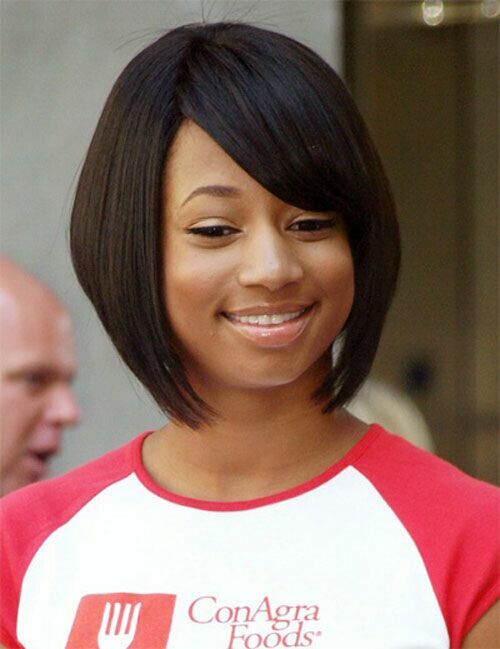 Natural or synthetic hair (extensions) can be used to switch up the style length. It is a time-consuming process, but the results are beautiful. It takes a lot of tools and product to get black hair into a sleek updo. You’ll need a comb, a hairbrush, a bristle brush, strengthening spray, edge control spray and hair gel. Once you’ve tamed the hair, you can try different styles on top, such as buns or ponytails. As the name implies, strands of hair are slathered in gel and twisted in one direction. You can either let the twists loose or keep them in, depending on if you want tight curls or looser waves. 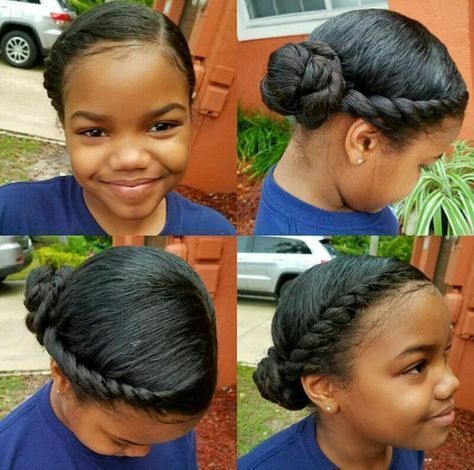 This is a cute hairstyle for any age. Unlike box braids, to braid hair into cornrows, the hair is braided very close to the scalp in an uprow, underhand manner to create rows of hair. They can be adorned with beads or designed into shapes. Perhaps one of the easiest hairstyles to do with black hair. 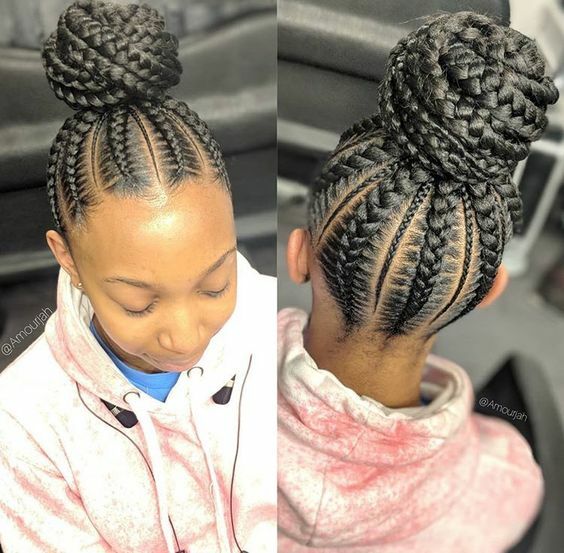 Simply gather the braids into a bun at the top of your head. 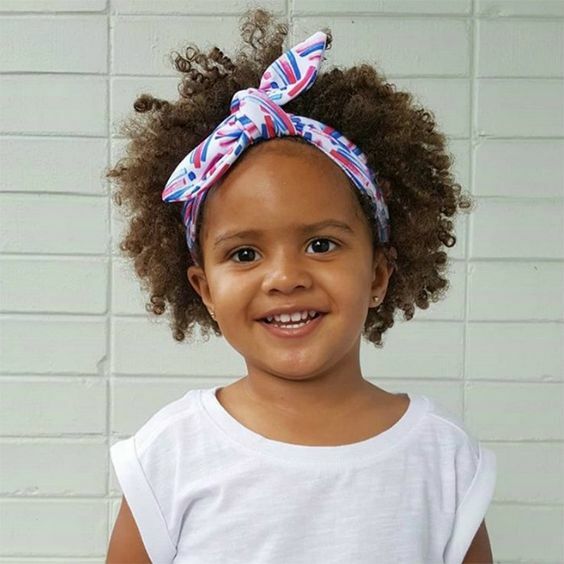 It can be tied with strands of hair, a scarf or elastic hairband, or hair clips. After you’ve separated your hair into sections and plaited each individual section, you can gather the hair into a high ponytail and secure it with a scarf or other hair tie. 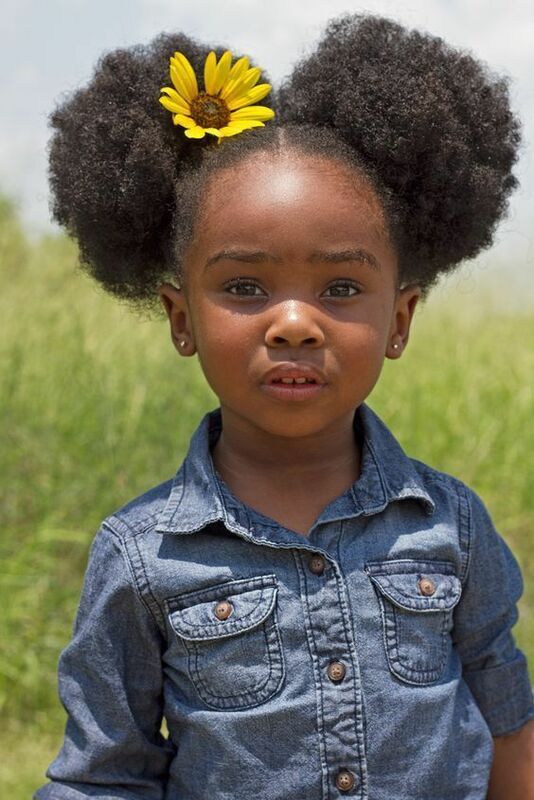 Also known as Afro Puffs, this adorable hairstyle collects natural hair into a bunch (a puff) and keeps it in place with an elastic band. 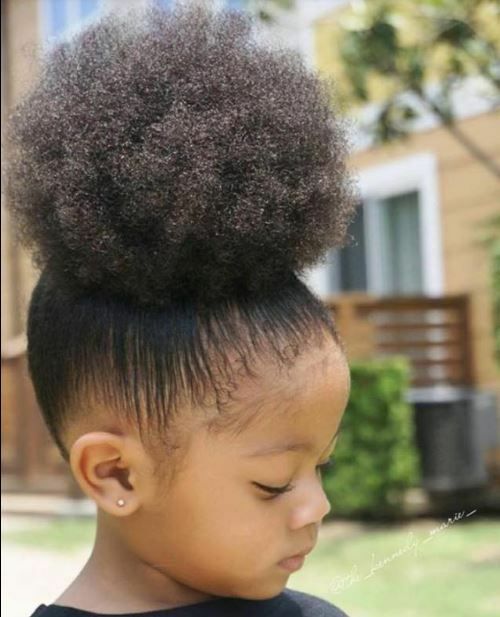 To get the double puffs, part hair down the middle and pull all the hair on one side into a puff with a comb and wrap an elastic band around the hair to hold it in place. Repeat on the other side. 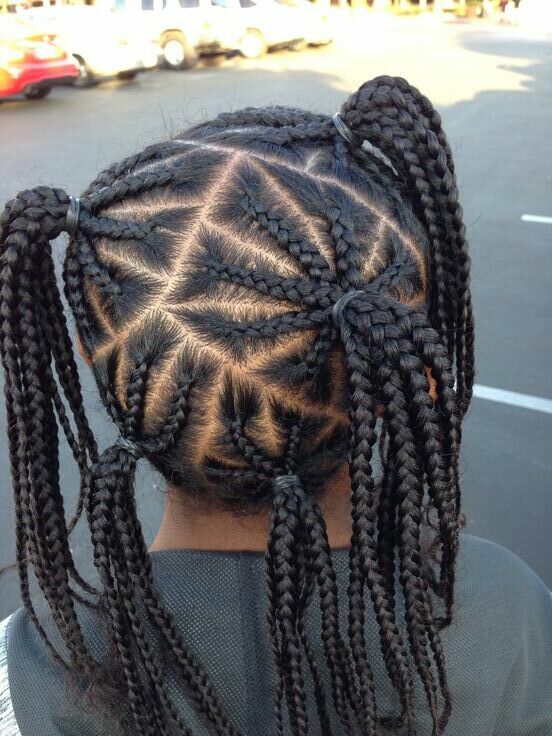 Very quick and convenient hairstyle! Girls — young and old — love half-up half-down hairstyles. For this hairdo, part your hair down the middle and gather the upper portion of your hair in a bun while leaving some hair loose on the bottom half. Secure bun with an elastic band and repeat on the other side. If you want a sleek hairstyle that looks hides the unsightly elastic band, use a piece of your own hair to tuck under the elastic so it looks your hair is holding the ponytail. Who said only boys can have faux hawks? 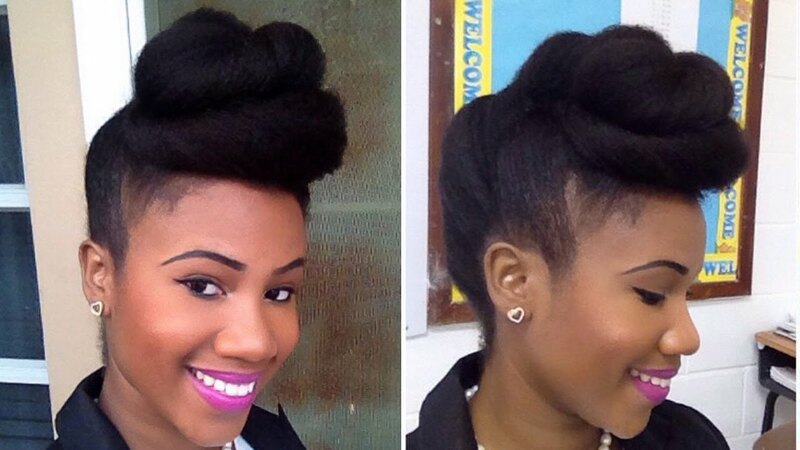 This hairstyle proves that girls can rock the hawk just as well. Start by combing your hair into sections and gathering a section at the top front of your hairline, braid the hair and secure with a tie. Continue braiding by sections until you have a “faux hawk” look going down the center of your scalp. 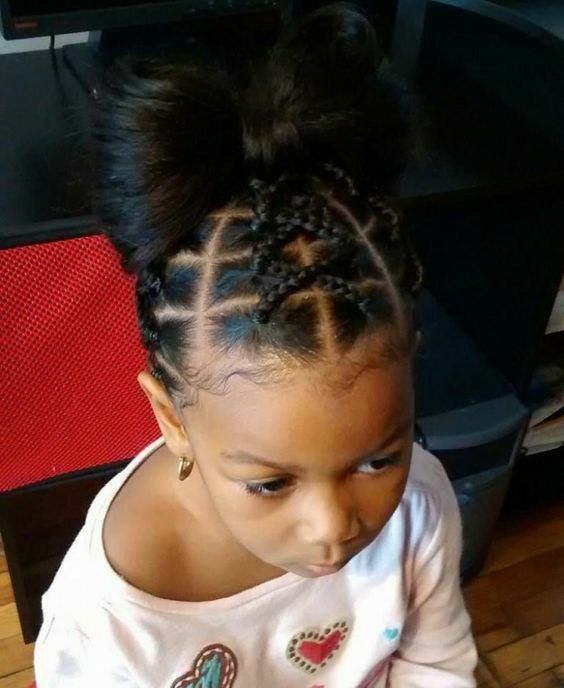 This cute hairstyle will turn all the heads on the playground! 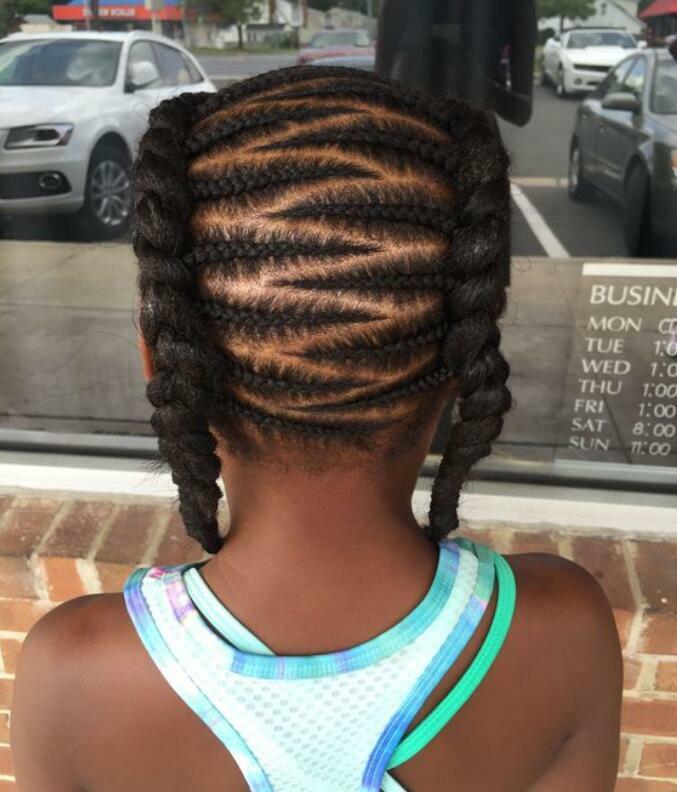 The first step is to create large box sections of the hair and braid each section into small braids. 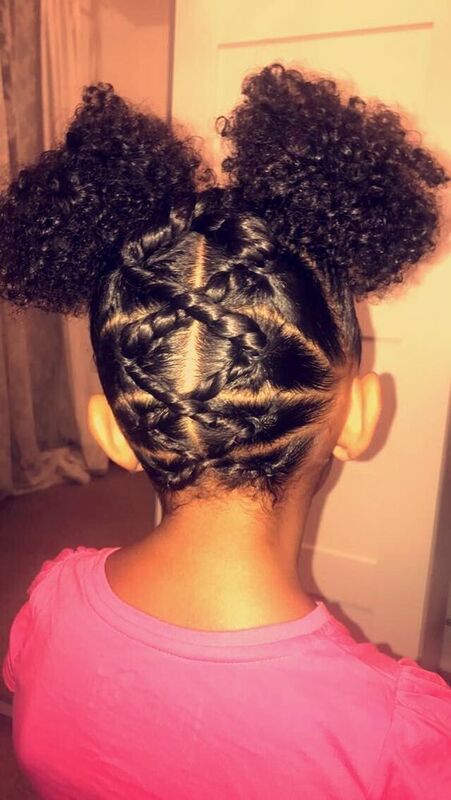 Then criss-cross two braids together in each section and connect it to the high ponytail. Updating a 1950s look into the 2000s! 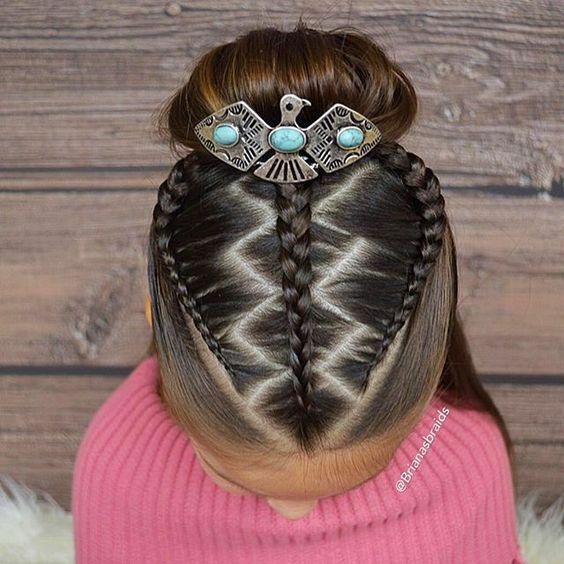 Begin by sectioning the front portion of your hair into a U shape and using a clip to keep it out of the way while you put the rest of your hair into a bun. Once that is done, hold the U section up straight then loosely roll it back and secure with a bobby pin. Use your fingers to style it into the look you want. French braids work best with medium-to-long hair. Begin by creating 3 equal sections of hair. Bring one outer portion over the middle section. Repeat with the other outer portion and continue the pattern, using your free fingers to ensure the portions remain separate. 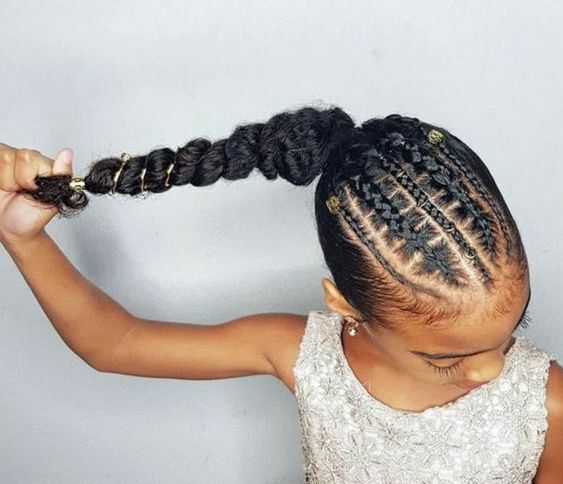 Once the braid lifts off your head, continue in a basic braid until you reach the end of the hair, then tie with an elastic. 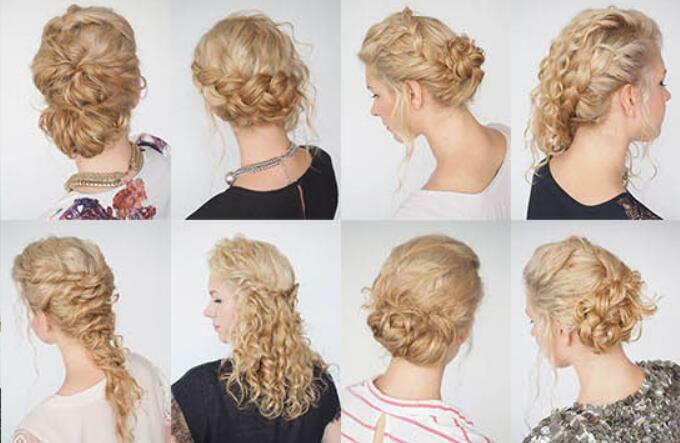 This hairstyle is combining two hairstyles — braids and the top knot – into one elegant updo. 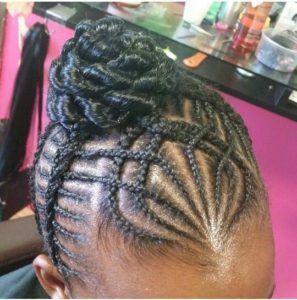 Begin by braiding small sections of the hair and then collecting all the different sections into a knot at the top of your head. You can use the braids to tie the knot instead of an elastic tie. 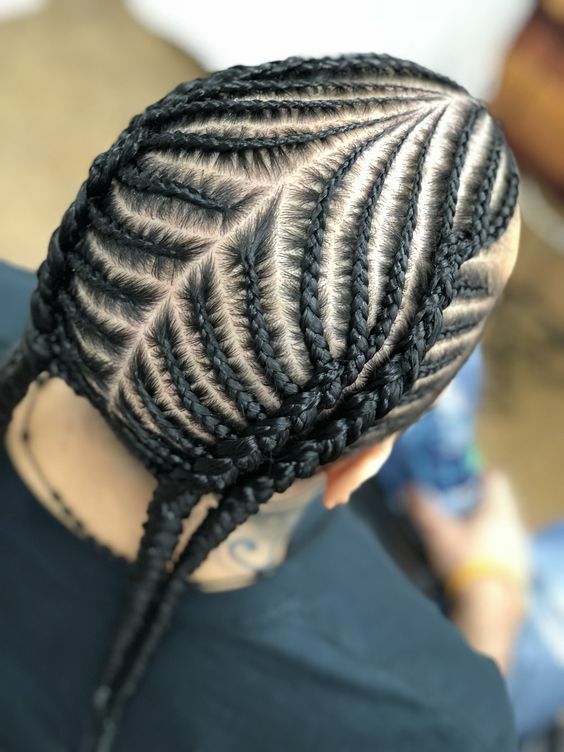 Fishbone cornrows are tiny braids close to your scalp with large spaces between sections. They are meant to be as tiny as fish bones. 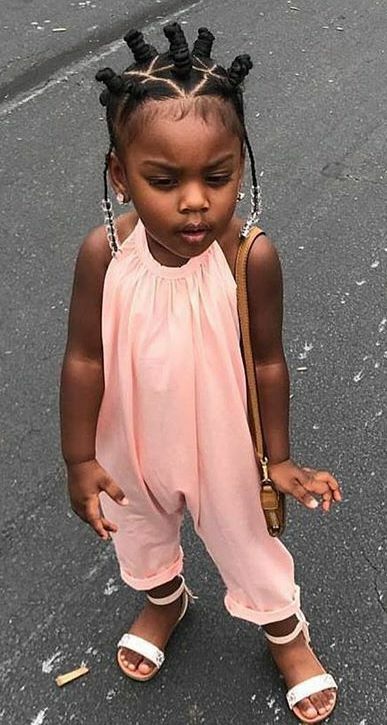 Another cute version of collecting all of your smaller braids into a ponytail and leaving the braids to swing free from the ponytail. 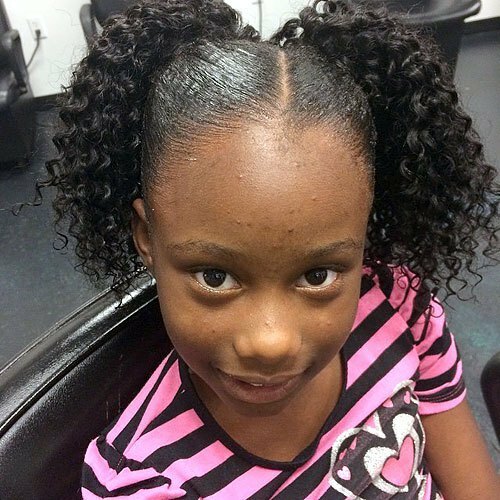 A fun and flirty hairstyle, Bantu knots are a popular choice for little girls. 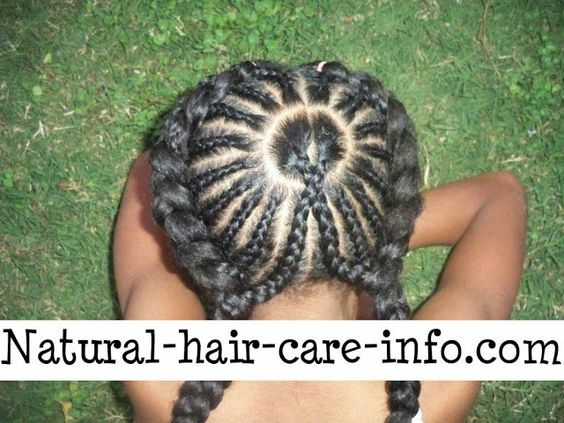 Begin by sectioning your hair into numerous sections, depending on how long your hair is. 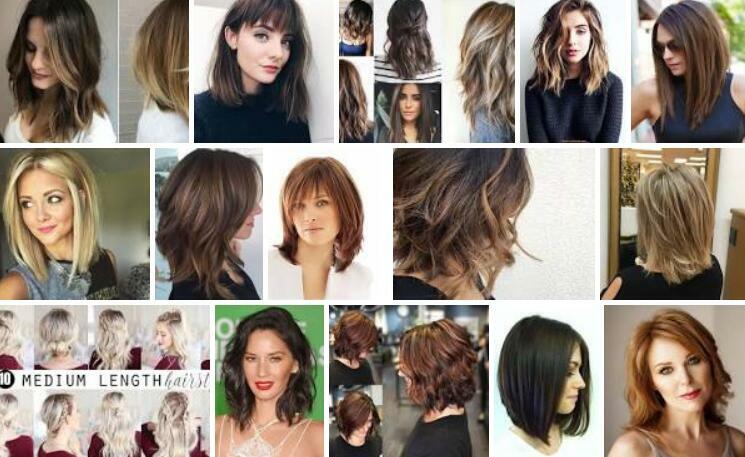 The shorter your hair, the closer the sections should be. Take one small portion of each section and wrap it into a coil close to your scalp, attaching with a bobby pin. Take the rest of the hair in that section and wrap it around the coil, securing it with a bobby pin or tucking it into the coil. Continue this process until all sections are done. Similar to the regular french braid, except for there will be two french braids instead of one big braid. Section your hair into two parts. Separate one part into three smaller sections. Weave the back portion under the middle into the center. Take the front and cross it under the center. Feed new pieces of hair as you braid backward, repeat until you get to the ends. Use an elastic band to tie the braid and repeat the process on the other section. A high side ponytail is very easy and very 1980. Follow the steps for a regular ponytail except collect the hair to your preferred side. Secure with an elastic band. 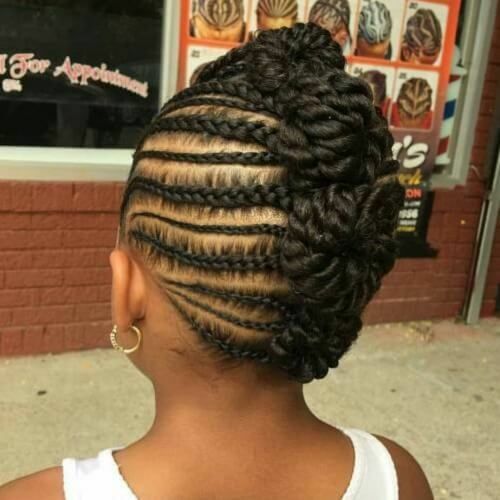 Part your hair into two sections – the half you want to braid and the part you’ll put into a puff. 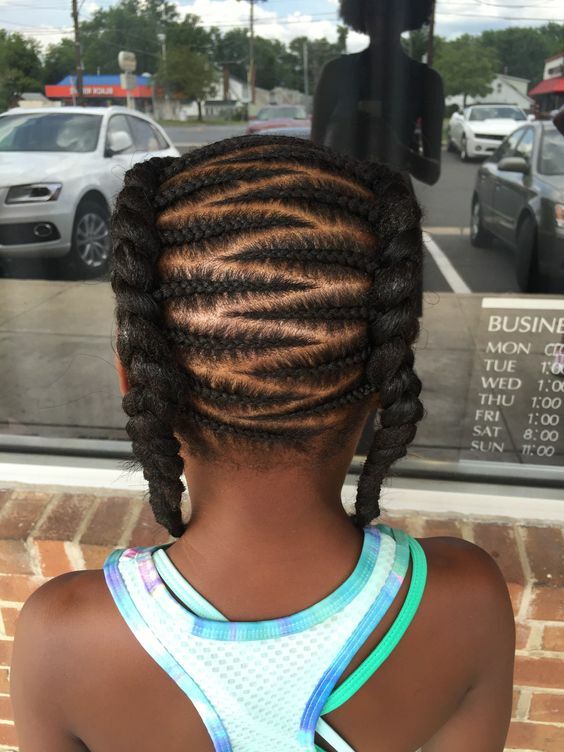 Take the braiding section and braid into small braids. 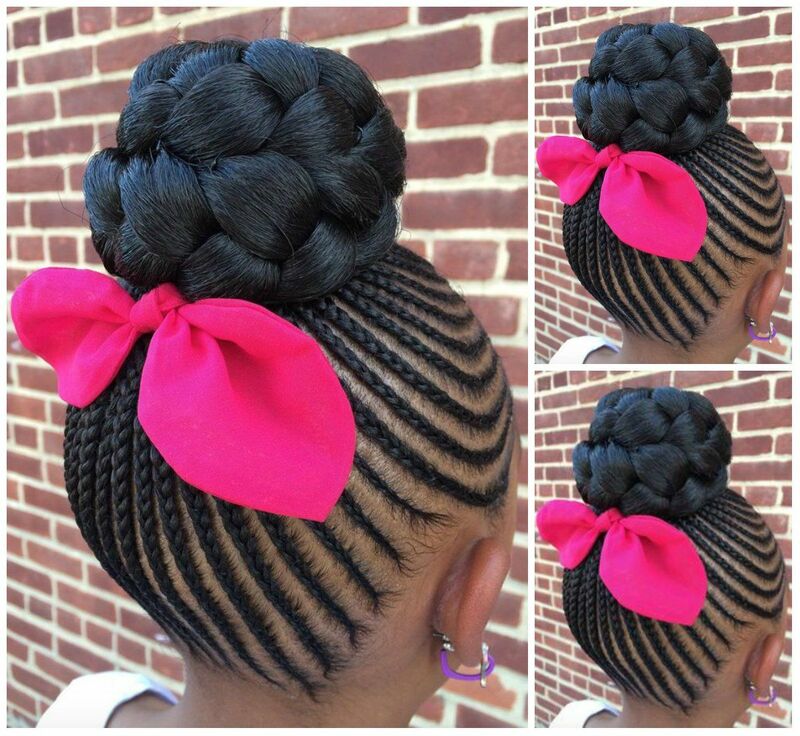 Pull the rest of the hair into a puff and secure with elastic, tucking the ends of the braid into the puff. 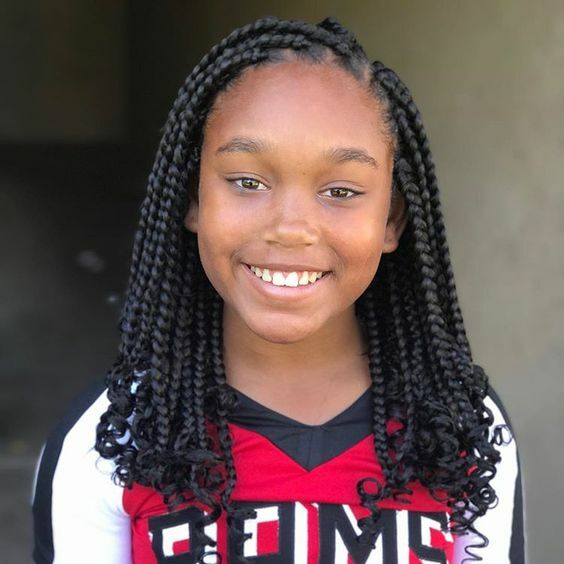 This is one hairstyle that can be perfect for the summer season especially if your daughter usually feels uncomfortable because of the summer heat. 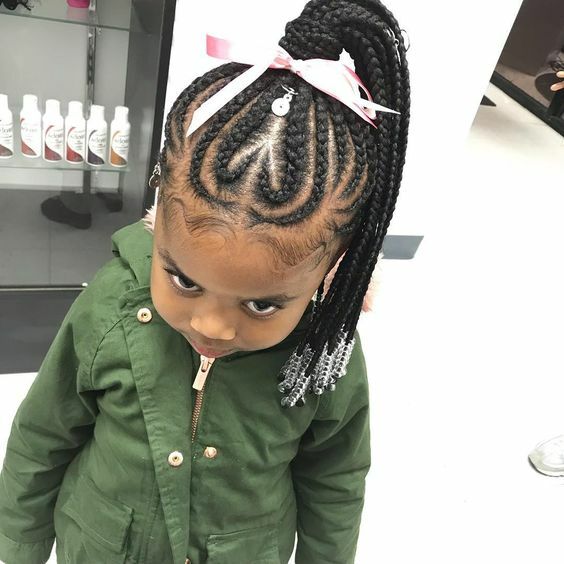 When you take your child for a haircut, you can keep the back part and the sides short but keep the front part so that your child’s hair will look like it has extra volume. 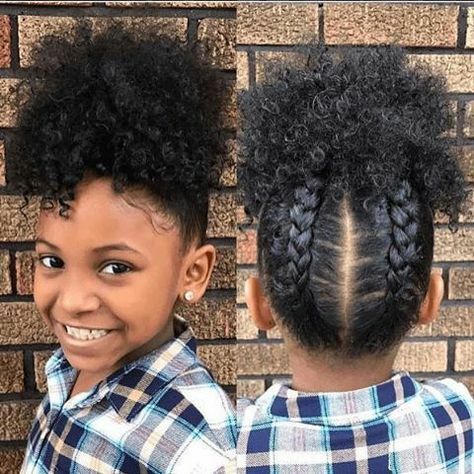 You can be sure that this cute hairstyle will keep your child comfortable and will still make her look and feel feminine at the same time. 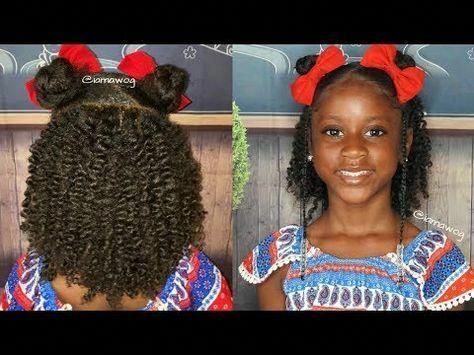 If your daughter has naturally curly hair as in with tight curls, you can make her life easier by making this short hairstyle. 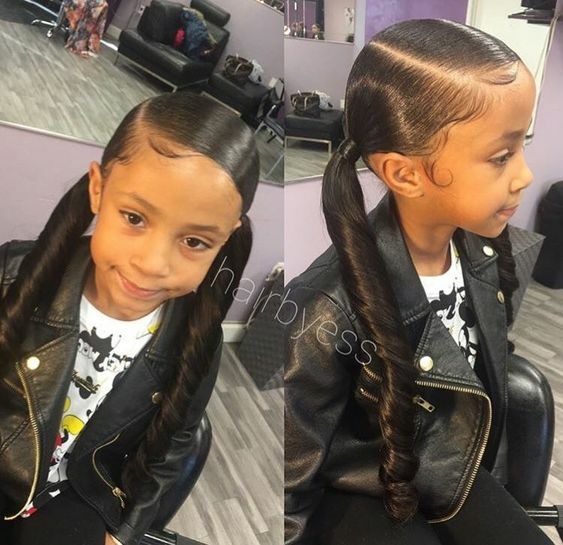 You can place on the side of your daughter’s hair for that instant more feminine look that she will surely love. 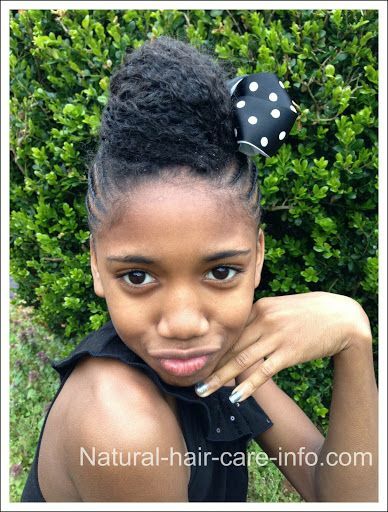 Make your kids hair up in a ponytail and twisting the end portions so that they will look more puffy than usual. This can be great for kids who are about 3 – 6 years of age. Do not be scared by the name. You simply need to start making a french braid along one side. The moment that you end the braid, you should make the braid into a bun. Make sure to secure this properly with the use of proper hair tools as well as gels to keep the hair in one place for a long period of time. 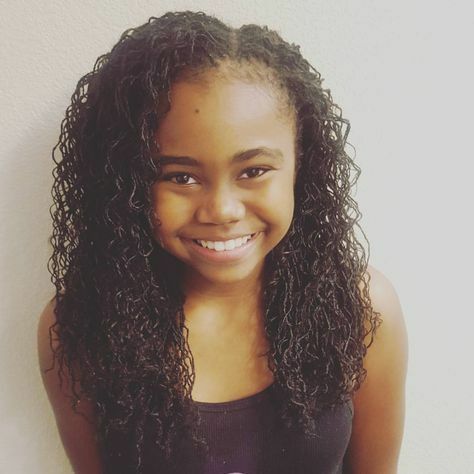 If you would like your daughter to have great hair as she slowly transitions into being an adult, you know that this style can be perfect. 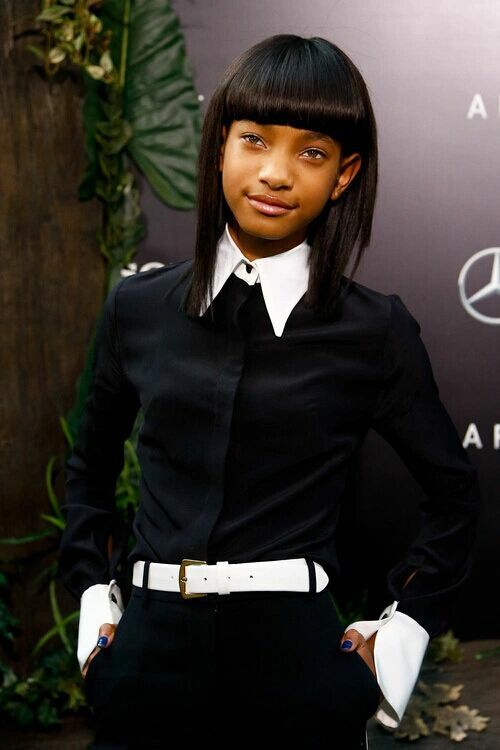 First your daughter should have medium length hair. Straighten the bangs so that it will be emphasized. Make sure that the back portion of the hair will remain curly but gelled so that it will not look too puffy. 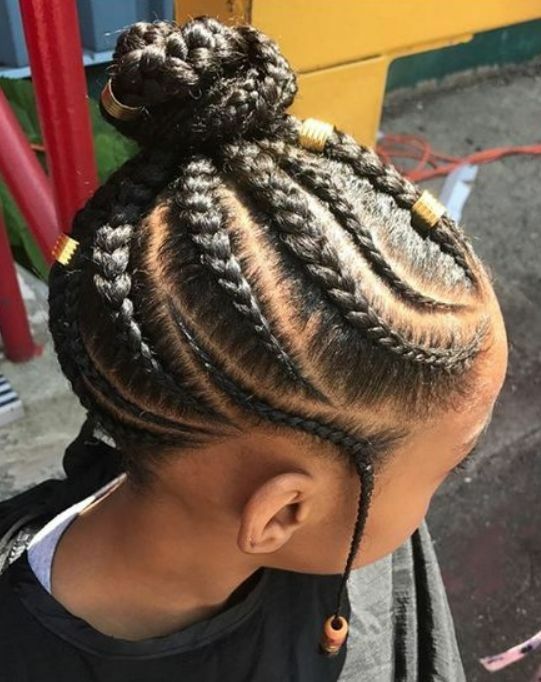 You will need to have cornrows already before you start this hairstyle. Simply pull the back cornrows up to the top of your head in a bun and secure with a hairclip. Chunky braids are very simple. Split hair into thick sections and braid each section. Then secure with an elastic bank. 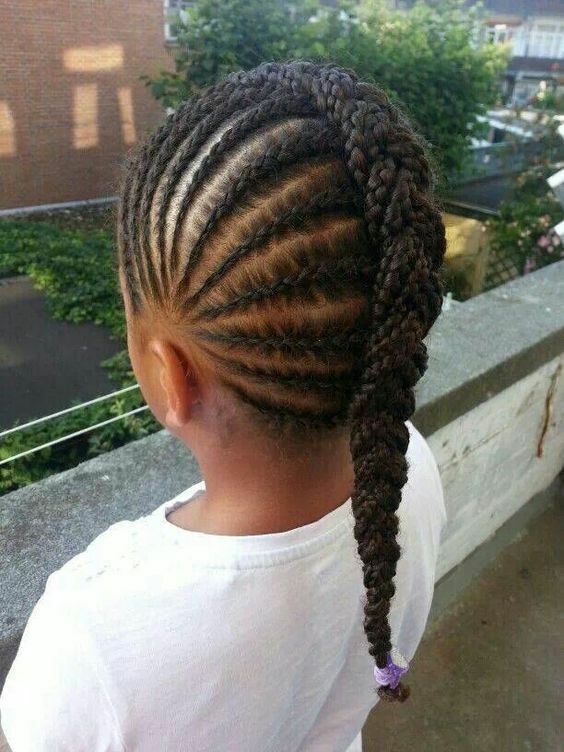 You can also braid into several mini sections and then braid those sections together into one super thick braid. To begin this look, apply moisturizer to hair, then use a wide tooth comb and bristled brush to push hair up to the top of the head. Place a large headband around your forehead for later use. Push headband up from forehead until you reach where you want the puff to be. Fluff out of the puff with your fingers. A bun with frizzy ends is a simple hairstyle. Just pull your hair back as if you were putting it into a high ponytail. Instead of pulling all of your hair out of the ponytail, leave it half in the elastic band and pull strands loose for a messy look. Beginning at the forehead, pull a comb through the hair directly to the right for an inch. Part the hair and then pull the comb left for one inch. This should create a small zigzag look. Repeat the alternating right and left parts until you reach the crown of the head. Divide hair into small sections. Twist the strands of each section in the same direction. 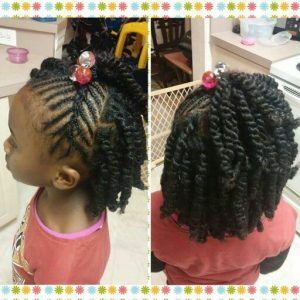 Moisturize twists with product and leave in overnight. Untwist each section in the morning for bouncy curls. 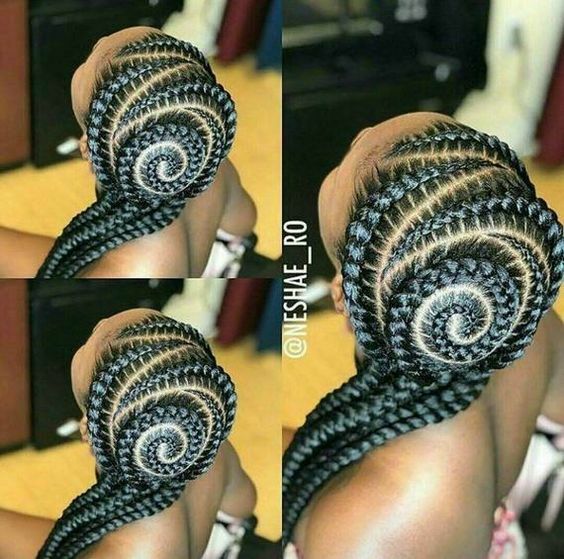 This hairstyle is very complex. It requires separating hair into sections and braiding in a circle pattern before securing with bobby pins. 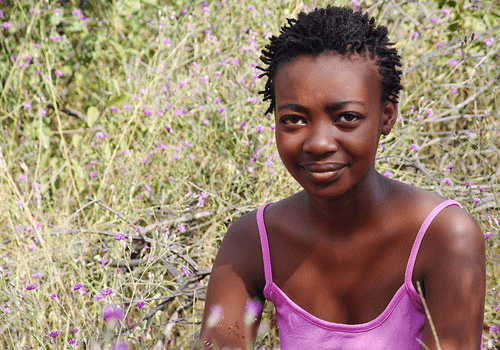 Since most African-American hair is short and brittle, extensions are needed for the braided halo. 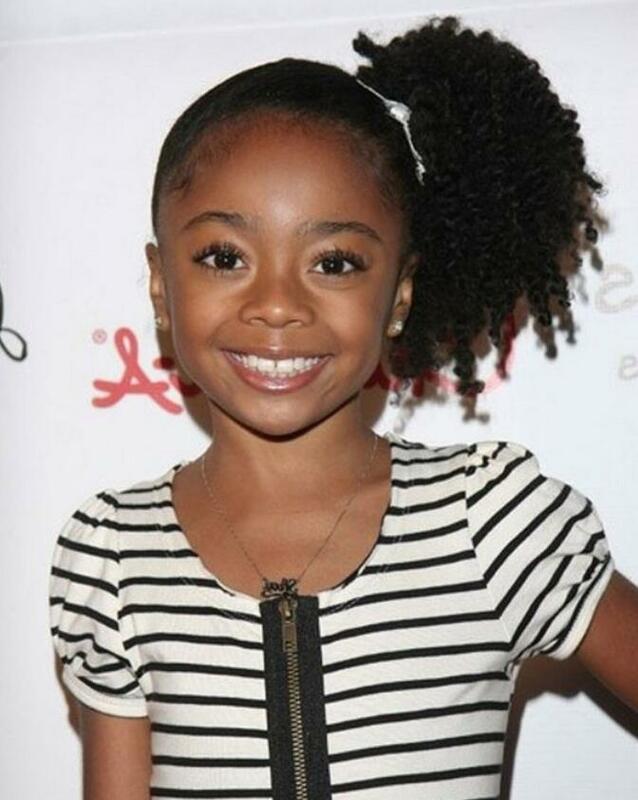 Put your natural hair into a low ponytail and braid into two sections. Use a bobby pin to secure each of the two sections to your scalp. Wrap the braided extensions around your head like a halo and secure with pins. 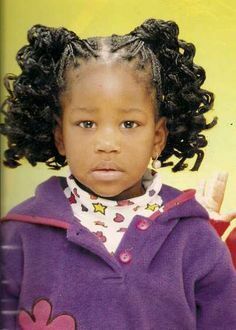 Corkscrew curls are also known as spiral curls. Begin by running moisturizing cream through your hair. Divide your hair into 4 sections and each section into 2 sub-sections. Wrap each sub-section of hair around your finger into a coil and hold it for a few seconds. 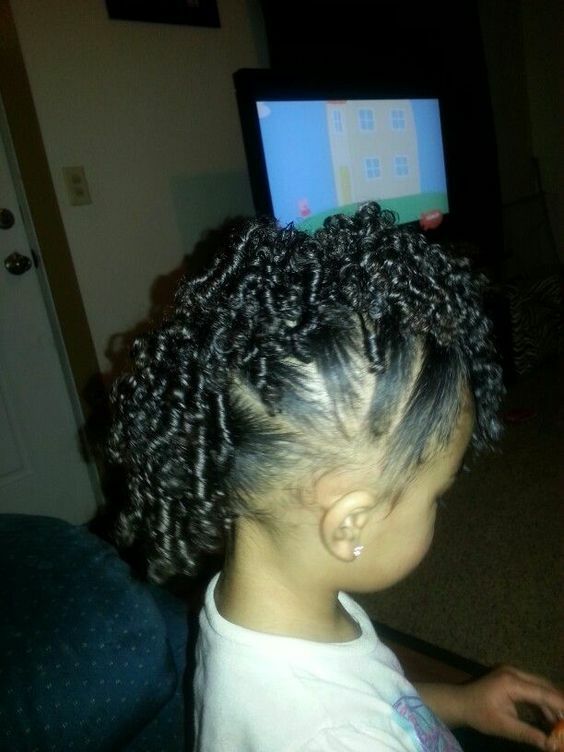 When you release it, you should get spiral curls. Repeat steps for all hair sections. 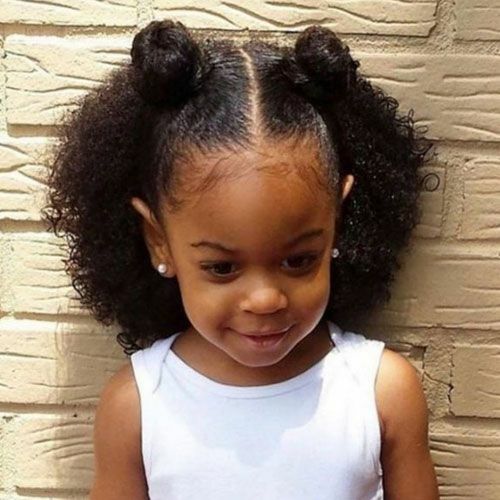 Pigtails are hands-down THE cutest hairstyle for little girls. Divide your hair down the middle into two sections. Pull the section on one side of your head into a high side ponytail with hair hanging loose. Repeat on the opposite side for the other section. Mornings before school with little girls can be torture. Rushing around trying to brush their hair into some semblance of a hairstyle while they scream bloody murder every time the comb comes near them. 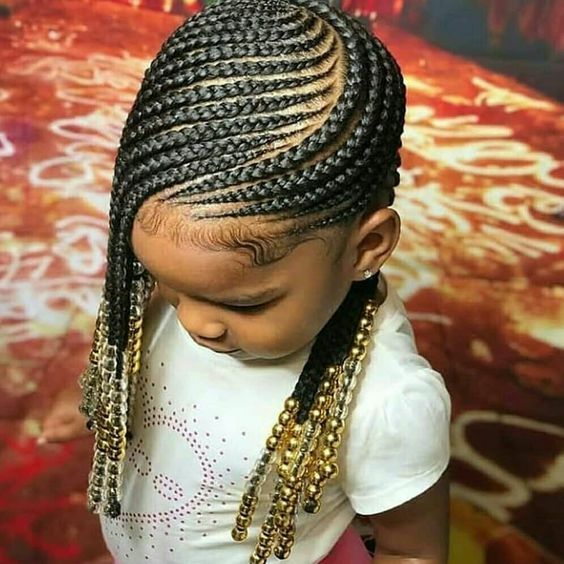 Some of these hairstyles are so simple, a child could do them. Others might require mom’s help. 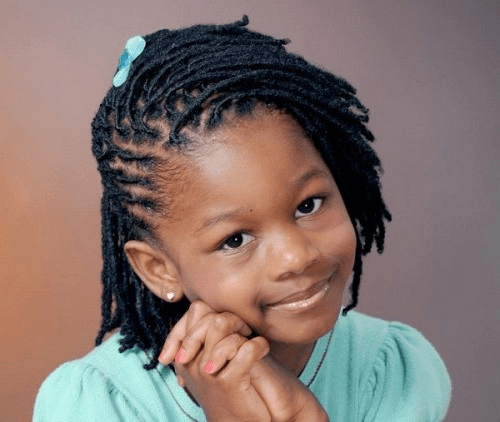 But your little girl is sure to find at least one hairstyle that she likes in this list.